This is a fairly recent book which take a somewhat unconventional view of the drawings and conflicts with the “conventional wisdom”. Or at least the standard view as presented by Maria Reiche, who has been the “Dean” of the field for a long time. I have one of her books somewhere….. I first ran into the lines during the 70’s when it was fashionable to think they were created by aliens or for aliens and were markers for alien landing places. I never came close to every buying that business, but they did remain somewhat of an enigma. 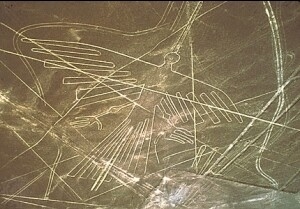 The standard view is the one provided by Reiche, who stated something line “Nasca is the largest Astronomy Book on Earth” and taught that the drawings were related to astronomy. Right off – the folks who seriously studied that view found that there was little to support the astronomy theory when one examines statistically the orientations of the lines. Stonehenge yes, Nasca, not even close. Those who did not support this view ran into problems and resistance from Reiche, who was revered by the local folks. This leads to difficulties with the locals and the government. This author presses the theory that the lines were related to a religion that sought to approach the Gods to insure the supply of water that they needed to survive. He makes a fairly convincing case that the vast majority of lines are related to water, either its source or its users. He postulates that the lines were drawn as pathways that pilgrims used to travel to sacred locations for religious services. This is supported by the fact that the lines seem to most commonly start and end at centers where many lines start and finish and radiate from and that these are often associate with the water. What is also true is that the current native population still to this day practices a form of geometric division of their land and cultural and civic responsibilities which has many similarities to the patterns of distributions of the lines. The author devotes quite a bit of ink, and his time, to the study of the local people, which sets his analysis apart from all the others I have read. I find this particularly impressive…after all, the lines were created by their ancestors. For one who is interested in the details of the lines themselves, not just the pictures taken from altitude, the book is filled with details of the lines, the stones that make up the lines, the artifacts that are found along the lines. The book is also extremely well illustrated and that alone is worth the price of admission. As for the pictures, well, they remain a real puzzle…..
More later, my sweety is calling me to bed.